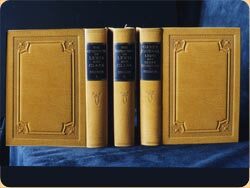 Lewis and Clark Books: New leather covers with blind embossing for Hosmer’s important three volume Lewis and Clark set. Black leather labels for the titles. Hand marbled paper end sheets. 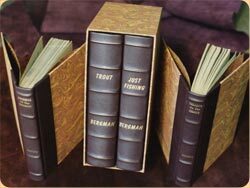 Fishing Books: New ¼ bound bindings (leather spine and marbled boards). A matching slip case was made to protect each set of books. 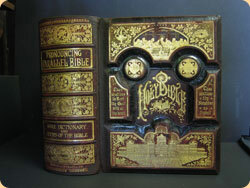 Before: A well loved and well cared-for family bible from 1850. Front and back covers detached. Family history pages between the old and new testaments record births, deaths and marriages. After: Leather cover repair (leather re-backing). 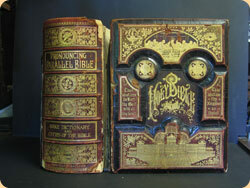 Bible repaired with new archival paper colored to match original leather and old spine attached.